One of the biggest uncertainty for a young adult is that you are unsure where your career will take you. Or whether you will stay in that career at all. Many people took a particular route and realize that they hate their job. This is why sometimes I feel doing 2 years of work in your industry before taking a degree might calibrate your university decision better. As we start working, many look upon their first paycheck as their first reward after studying for so much. There are expectations how much they should earn. But many failed to take a step back and realize how much they would earn in their lifetime. Most of us underestimate the amount. I never thought of how much money that will enter my management for the past 14 years when I started out. This sounds like an optimistic sell, but for most people they wouldn’t take a paycheck that is less than what they earn in their last job. If you are in the same industry, you will expect to earn more than your last job in the industry. There are those that sacrifice a high pay to get into another domain of their choices. Even if they do, it is likely their pay is as comparable to the old one, unless their previous pay is abnormally high, or from those industry that pays much better. Depending on your education level and grade, the opportunity you seek, and the industry you work in, your gross monthly pay can vary from $2000/mth for diploma graduates to $4000/mth for good honors degree graduates. How much you take home annually will vary from $20,000/yr to $40,000/yr and even more for some. Your 20s is characterized by some of the fastest wage growth rates. The likely growth over the next 10 years could be 5%/yr. There are even some that would tell me that is slow. For a university graduate, they are likely to see their take home pay progress from $31,200/yr to $50,821/yr. We seldom project forward 10 years of how much we could possibly take home. If we do, you will realize that the sum of money can be rather substantial. If your starting gross income is $2000/mth, $238,000 to $287,000 may passed through your hands. If your starting gross income is $3000/mth, $357,000 to $431,000 may passed through your hands. With this amount of money passing through your hands, you have the choice of learning to make wiser decisions with your money, or lived a decadent lifestyle. Or somewhere in between. How much could you possibly save in 10 years? This is a favorite question of many and the answer is, the max limit would be the table above. Purely from your ability to save and no increase in rate of return. According to my Wealthy Formula, earning and spending goes hand in hand. There are spending within your control, and not within your control. The above spending profile is one that may be closer to the annual survival expense (what is this) of a diploma graduate. There is no room for anything extra. This is your choice between a richer life and one that is in more control. A frugally optimized expense could come up to $9036/yr. The above expense profile fits that of a degree graduate. There are more extravagant spending. The meal allowance is bigger (much bigger), more taxes (higher salary) and contribution to household expenses. Could a degree graduate live on the annual expense profile of a diploma graduate? That is very possible, if the graduate do not really have huge money sapping hobbies and lived a deliberate life with a strong saving purpose. It is difficult to model the spending profile of a diverse group of people. This spending profile is what I think is the bare minimum. There may be situations that force you to spend more than this. Given the right and sound justifications, that may be ok. 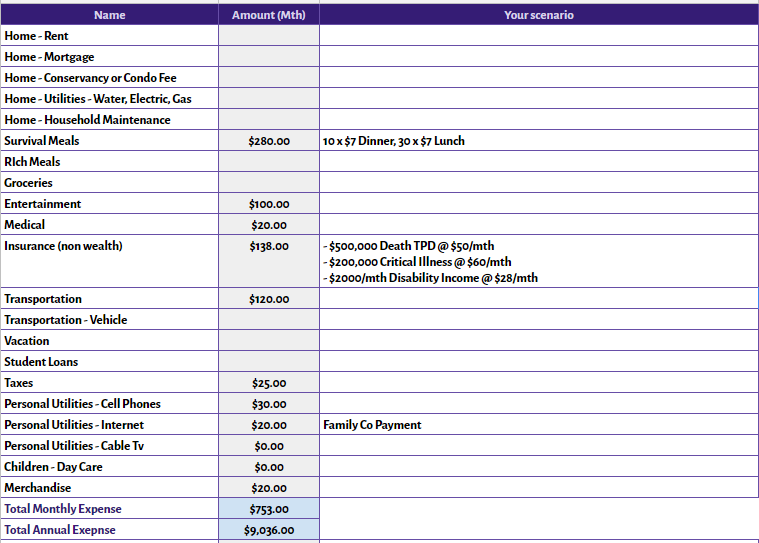 Your expenses will grow over time and in 10 years, you are likely to spend the amount as illustrated in the table above. If you are not very clear about matching what you value to your spending, that sum would balloon to a bigger amount. How much could you save in 10 years? 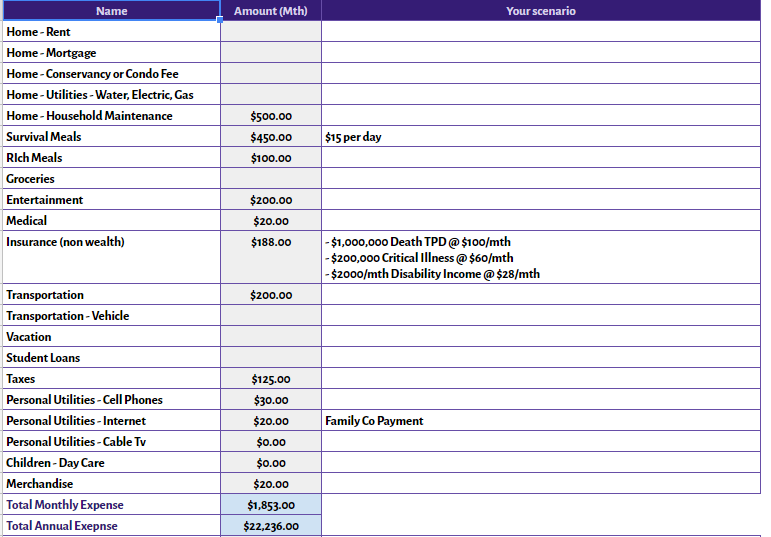 We take it that if the person earns $3000/mth or less, his expenses is $9036/yr and if its more $22236/yr. For an individual, if you have not gotten married, or supporting your family, in 10 years you should have $100,000 to work with. The interesting thing about the table above is somehow, those earning $3000 gross and below save more than those degree holders. Again, if you are a degree graduate with a spending profile somewhere in between, you are likely to approach $200,000. I worked with my fair share of engineers who started off as diploma graduates. Eventually their pay didn’t stay at $2000. This is by virtue of them increasing their academic qualifications and getting better in their core competency. I have seen my fair share of degree graduate engineers whose pay did not go anywhere. Your human capital at the start of your fledgling career is important, so learn to harness it well. Jump out of the cycle of the $2000 gross income zone and into that of the $2,500, 3,000 and even $4,000 zone. If you extrapolate your expenses over 10 years, you might think twice whether it is a good idea to spend on that thing. What if you could receive 10 years of your future income today? Do you feel confident to manage that amount of money we illustrate in this article? If you have doubts here, perhaps its time to pick up some wealth building knowledge. You could start by reading some of my better articles in the resources section. In all honesty, many folks would have said my expenses profile is not possible in their circumstances. My answer to that is: You earn that much in 10 years. You can choose not to save $100,000 if you deem other aspects of your life to be more important. Whether we save $100,000, $200,000 or $300,000 in the next 10 years is less relevant than what kind of life you live in this 10 years. Money is easier to earn back than time. However, don’t use saving time as an excuse. There is a middle ground somewhere and its up to you to find it. Yup , agreed. There has to be a balance. Whilst saving is important, knowing when to splurge on your wife or parents once in a while is more important. Time and tide waits for no man. Going out with parents or wife for a nice meal, bringing them happiness. Been your blog for a couple of years now. Hi Silent Reader, we only have limited time on this earth, so if we value those relationship then it is best we make the best of that limited time.